Sri Aurobindo’s birthday on the 15th of August provides an occasion to remember his forgotten wife, Mrinalini who died in the scourge of influenza at the young age of 32 while waiting in Calcutta to go and join her husband in Pondicherry. Very little is known of her. Few letters between her and Sri Aurobindo survive as, according to her cousin, she wanted the box in which she kept them to be offered to the Ganga after her death. The few that remain are those confiscated by the police on the night of Sri Aurobindo’s arrest in the Alipore conspiracy case. In addition there is a small reminiscence by her father Bhupal babu in which he describes Mrinalini as having nothing uncommon about her. Mrinalini was 14 years old when she married Sri Aurobindo in April 1901, who was 29 at that time. 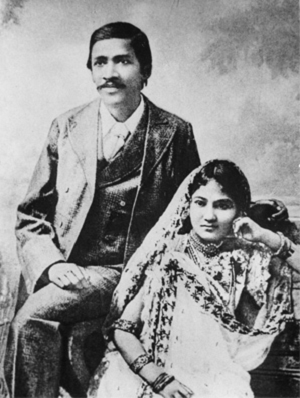 They met through an advertisement that Sri Aurobindo put into the newspaper indicating his desire to marry a Hindu girl according to Hindu rites. A close friend of her father’s, Girish Chandra Bose, arranged the marriage. It was a Hindu ceremony attended by eminent persons like J.C.Bose. Lord Sinha and others as Sri Aurobindo was already a name in Calcutta, but not by his own family who were Brahmos. Mrinalini herself had studied at a Brahmo girls’ school in Calcutta, but all her life she tried to live up to the impossible ideals of a ‘Hindu wife’ that Sri Aurobindo demanded of her. After four years or so they seemed to drift apart perhaps because of the ‘generation’ gap between them but more probably because Sri Aurobindo became increasingly preoccupied with politics, the organization of a secret revolutionary party and was also getting drawn to yoga. He also started the journals Karmayogin and Dharma which consumed a lot of his time. That Sri Aurobindo was aware of what she must feel is evident from the well known letter he wrote her in 1905 in which he was certainly trying to shift the responsibilities of a householder from his shoulders. He described himself as “a strange person,” “a mad man” who could never make his wife happy but he said, Hindu religion loved extraordinary characters, endeavors and ambitions. The wife of such a person was bound to be miserable but the sages fixed a way out of this by declaring that for a woman the husband was the supreme guru. She shared his dharma and so was bound to help, counsel and encourage him in his endeavours. She had to regard him as her God and make his joys and sorrows her own. It was for the man to choose his work and for the woman to give him help and encouragement. Sri Aurobindo’s question to Mrinalini was whether she would accept this path. And would she have the capacity to do so? take refuge in God, enter into the path of God. He will fill up all your wants. Or if you have faith in me, I shall impart my strength to you which, instead of reducing my strength, will increase it. This of course placed the burden of responsibility and the eighteen years of her marriage were mostly spent in loneliness and often solitude. After Sri Aurobindo’s arrest in 1907 and although he was released a year later, Mrinalini experienced the dark night of the soul when she felt that she “couldn’t call even God” because she “had no other God” except her husband. She had “seen God’s manifestation in him alone.” Death seemed to be the only way out but at that moment Sudhira, her friend from school took her to Ramakrishna Ashram and Mrinalni began to frequent it from that time onwards. She was of course a celebrity as Sri Aurobindo’s wife but she kept aloof as far as she could. Sarada Mata, Ramakrishna paramhansa’s wife, who came to love her deeply assured her that Sri Aurobindo would be proved innocent but he would not lead a worldly life. After his release from the prison Sri Aurobindo left for Pondicherry unknown to everyone including Mrinalini. The eight years that followed were the dark night of her soul but Mrinalini transformed her suffering into a sadhana to become a “heavenly being” in the words of Sarada Mata, wife of Ramakrishna Paramhansa to whom she turned during this period. Mrinalini’s father took her away to Shillong where she steeped her life in austere tapasya. She ate simple vegetarian food and always dressed neatly looking like a yogin. Every early morning, after her bath she would pluck flowers from the garden and then go to her Puja room which had beautifully decorated pictures of Kali, Sri Vivekananda and Sarada Mata together with that of Sri Aurobindo to which she offered flowers and incense. She would meditate there for hours and then spend the day reading religious books mainly of Vivekananda and Sri Ramakrishna. In the evening, too, she meditated alone for hours. Letters arrived sporadically from Sri Aurobindo and enlivened her spirits for a while but her marriage had actually ended. However she felt an inner bond with Sri Aurobindo and never ceased to hope that she would be united with him. At last when it became a possibility in December 1918 death intervened. The mental agony that she had suppressed for years exploded during the delirium of her illness especially the nightmarish experience of the night of Sri Aurobindo’s arrest when she had been with him. The otherwise still and detached Sri Aurobindo, too, on hearing the news of Mrinalini’s death, was moved to tears. It is remarkable that Mrinalini sold many of her ornaments during her lifetime to contribute to charitable causes. Her last wishes were that the remaining ones were to be kept in her friend Sudhira’s custody, to be sold and a scholarship instituted for a poor girl-student of the Nivedita Girl’s School with Sri Aurobindo’s approval. Ironically it was in separation and suffering that Mrinalini fulfilled the role of a ‘Hindu wife’ assigned to her by her husband proving both him and her father belying both the words of her father and husband who had judged her so unjustly. She deserves to be remembered as a profile in courage who overcame impossible odds to find some meaning in her life; a flower that blossomed unseen but left its everlasting fragrance. I bow my head to a great lady Mrinalinidevi.great respect for great lady Mrinalinidevi. Marriage may not always mean merger of two different souls.Two differenent persons can never be EXACTLY ALIKE. Read with avid interest your description on the tragic life of Smt. Mrinalini devi.In1964-68-period I befriended one senior doctor by the name Group Captain S.K.Bose--a retd.RAF medical officer-who saw active service in ww2 and on retirement was recruited in West Bengal Medical Service under Lt. Gen Chacravarty-another retd.army doctor--as his deputy.He used to tell me --he was Smt.Mrinalini devi's youngest brother and about many incidences in her life--which were certainly not pleasant.You seem to be a historian.I shall be interested to know was this gentleman--Group Captain S.K.Bose was really the youngest brother of Smt.Mrinalini devi? Awaiting your reply. With regards--nirmalyakumar. We are all great disciple of Shri aurobindo, the mother since three decades.... And the story , sacrifice , of the wife of Shri Aurobindo - Maataji.Mrinalini brought tears in us... As well the sacrifice of .Shri Aurobindo 's family life ,his guilt feelings towards his wife for having deserted her for his sudden attraction towards religious activities and becoming a sanyas and his inability to take a last glimpse when his wife left the world because he can not leave Pondicherry to avoid being caught by the blood thirsty Britishers . Reveals no one live or lived in the world with fullness without undergoing pain atleast in some part of their life..
Must congratulate Kavitaji for a very informative and sensitive article about a person so noble and so little known. Such a great sacrifice for a great husband, is really great memory of the great wife. Thanks for this informative treatise. I do not think anybody can hide anything if we have intention to know we shall be provided with that information by the unverse through some way or the other. Thanks for enlightening us about a great soul. Saw a stray remark in some of the reminiscences about Shri Aurobindo that there indeed was a marriage. Now from Google I got this link, thank you. Wonder why she is not mentioned in the 'official' records so to say. Very informativ and interestig .A great work done . My Compliments. Thank you for this upload. In all the biography I have come accross, his marriage to Mrinalini has been carefully avoided. May be the topic is uncomfortable to his followers. the article brings to life mrinalini and one felt as though one was listening to an intense melody soaked in pain and suffering. one can only say '???? ???? ????'! was able to do. That was society's loss! but even if she would have chosen to be 'private' ,why should the system of social recognition not shine its light on the exceptional people in their own sphere? And this is society's injustice! thanks for bringing these two to light. as for me i pay my deepest respects to my exceptional sister. Most wives of great men have a tragic personal life. However, Ma Mrinalini's story of raising herself above her personal tragedy and imersing herself into a perpose is inspiring. You deserve our collective thankfulness for sharing this beautiful, painful but meaningful life with us. Many thanks for sharing the life of an extraordinary woman. this strength and and tenacity is to be shown and known as widely as possible. Each one of us has to do our part, you are doing yours. Compliments. thank you for giving all information. Thanks for the well researched article. For us ordinary humans it is difficult to understand the whys and whats when it comes to understanding the lives of great men and women. One thing though is quite certain that Ma Mrinalini was extraordinary and that no other woman of her time could have succeded in leading the life as she did. If Sharodamoyee Ma loved her deeply that itself shows that Ma Mrinalini was no ordinary person. From the human point of view her life was tragic but spiritually she became a Saint.